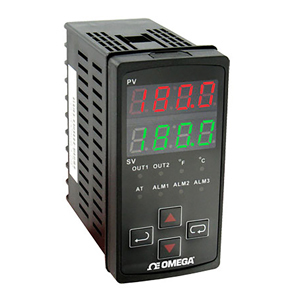 *Requires external 250Ω precision shunt resistor, OMX-R250 (sold separately). The CN7600 Series 1/8 DIN temperature/process controllers offer versatility and reliability for temperature and process monitoring applications. Designed as a vertical mount 1/8 DIN controller, the CN7600 features dual outputs, universal input, and up to three additional alarm outputs. The second output can be configured as a third alarm output. Select the alarm type from 13 different preprogrammed alarm functions. Control methods include ON/OFF, PID, auto-tune or manual tune. PID control is supported with 64 ramp/soak control actions. RS-485 communication is standard on the CN7600 with up to 247 available addresses.